The Ocean….Its vastness covers over 70 % of the earth and its five major regions include The Pacific, the Atlantic, Indian, Arctic and Southern oceans. These bodies of water are responsible for our atmosphere, climate, life enriching oxygen and a habitat for hundreds of thousands of marine life forms. It moves industry… with over 90% of global trade being carried by ships. Nutrients from the ocean are used for medicine, oil, food, textiles, fertilizer and for human consumption and pleasure. These gifts come with a steep price though. Our ocean system is now more polluted than ever before. With oil spills, sewage, coral reef degradation, sonar testing, over fishing, illegal dumping and marine debris, we are altering this natural ecosystem. As humans, we are responsible for this destruction and we must act to protect this immeasurably valuable resource. It is up to each one of us to take part and make a difference. 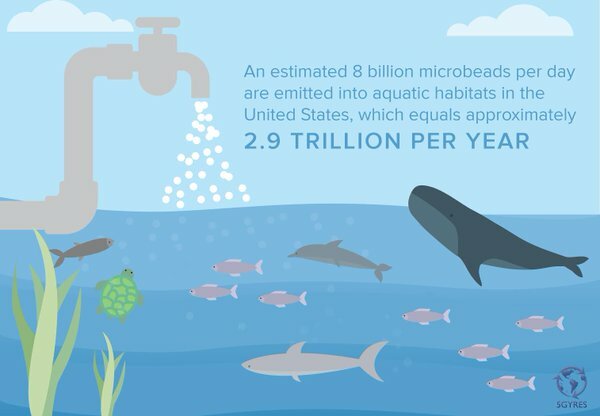 Take the first step and buy personal products that are micro-bead free. This choice not only creates momentum towards change but it is helping stem the tide of plastic pollution. We are Water! We cannot live without it. It is up to us to make changes today, so our children can have a better tomorrow. To learn more about which products are micro-bead free, click here!